Summer time is here and it is time for some fun in the sun whether it is a day at the park, a day boating on the lake, or a trip to the beach! Time to load up the car and kids and head out and enjoy summer for what it should be- some relaxing time with family and friends. 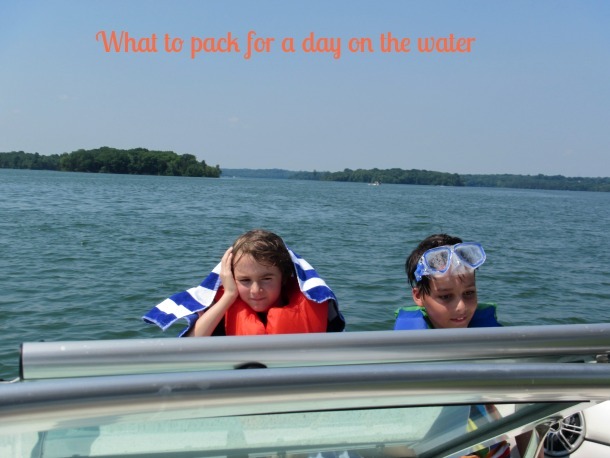 Here is what to pack for your a day boating or at the beach. This post is sponsored by Fisher but all opinions expressed are my own. 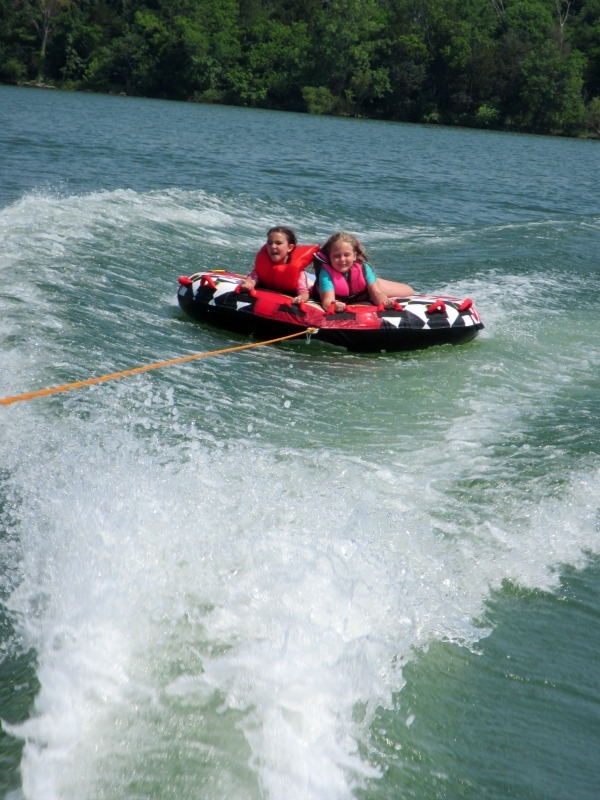 We recently got invited to go boating on Percy Priest Lake with some friends and we had so much fun! I hadn’t been boating in awhile and the kids were so excited to go. I had everyone wear swimsuits and I packed up a big bag of take alongs to make sure we had a smooth and fun trip boating. Life preservers (if not already on board the boat). You will want to pack these fro a trip to the beach too if your children are not yet strong swimmers. As my snack I brought along Fisher’s new snack product, Fisher Nut Exactly snack bites. They just became available at retailers nationwide beginning this June. They are so delicious. I mean really tasty- salty, and nutty, and chocolatey! Yum. The first snack of its kind, Fisher Nut Exactly is a combination of roasted nuts and whole grain popcorn, rolled into a bite sized snack that’s dipped in milk chocolate, dark chocolate, peanut butter or salted caramel. You know your mouth is watering now, right?! They are very satisfying as a snack that has some savory protein and sweet to it all at once. 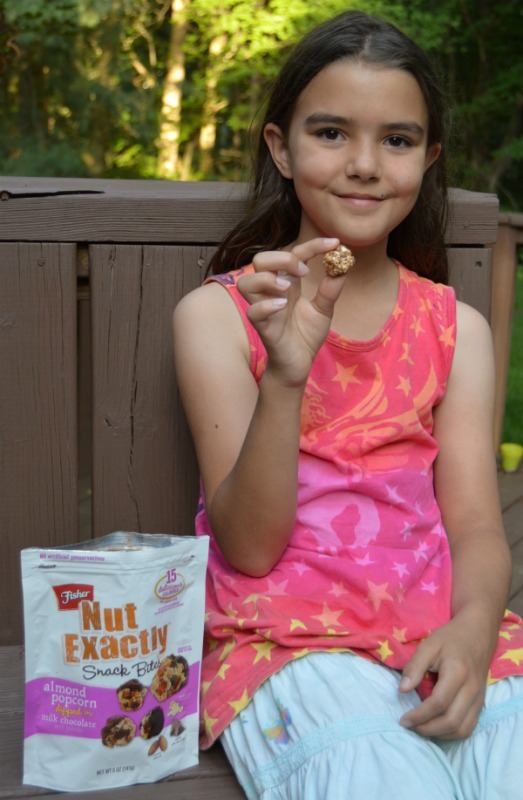 At 15 to 16 calories per gluten-free snack bite, Fisher Nut Exactly makes smart snacking scrumptious. I also like that they have no artificial preservatives. Fisher Nut Exactly Snack Bites are available at a Walmart retailer near you! Check out Coupons.com for a special deal on Fisher Nut Exactly snack bites at Walmart in your area*: http://www.coupons.com/?&cid=18814384 *You must be logged in to your coupons.com account to see the deal. One lucky reader will win one suite of the new Fisher Nut Exactly™ snack bites and one $50 Visa Gift Card. Winner announced above in the Giveaway Tools widget on June 30, 2015. Winner will be selected through Giveaway Tools and I will notify by email. Winner must respond within 4 days or the prize will be forfeited and alternate winner will be chosen. Your email will not be shown and will be kept private. Would love the Almond Popcorn! My favorite flavor would be the pecan popcorn dipped in salted caramel. i love anything with pecans! i can just taste the pecan flavor!! would take it camping. The Pecans/Popcorn/Salted Caramel sounds delicious! I love the chocolate almond flavor..it is very tasty. I love the peanut butter flavor . The peanut popcorn dipped in peanut butter. My favorite flavor is the Salted Caramel – oh yum! They all sound delicious but the Pecans/Popcorn/Salted Caramel really speaks to me! The Peanut Popcorn Dipped in Peanut Butter sounds really good. I am a peanut butter fan! Oh the Peanut popcorn dipped in peanut butter sounds so good! I would like to try the Almond Popcorn dipped in Milk Chocolate. It looks delicious. The almond blueberry dark chocolate sounds good to me! My favorite flavor is the Salted Caramel! I need to try this snack! I would like the Pecan Popcorn Dipped in Salted Caramel. My favorite kind is the peanut popcorn dipped in peanut butter. Almond Blueberry Dark Chocolate sounds wonderful! Almond Popcorn Dipped In Dark Chocolate! I’d love to try almond blueberry dark chocolate, it sounds yummy! I’d like Pecans |Popcorn |Salted Caramel on the couch with a good movie on. Salted Caramel-Love!! Always on the go with 4 kids so this is so great to grab and go. id love to try the almond popcorn dark chocolate! sounds delicious! The Peanut Popcorn dipped in Peanut Butter sounds really good. I love the almond popcorn dipped in dark chocolate. It is divine! I would like to try the Almond Popcorn Dipped in Dark Chocolate. Almond/popcorn/dark chocolate – how can you go wrong? Thanks! My favorite would be the Almond Popcorn Dipped in Dark Chocolate. Dark Chocolate Almond Popcorn sounds good! I’ve never tried Fisher Nut’s before, but I’m guessing my favorite would be the almond popcorn milk chocolate. I love the pecan popcorn dipped in salted caramel. I would like to try the pecan pop corn w/ salt caramal. I’d love to try the Pecan Popcorn dipped in salted caramel. These sound delightful! The peanut butter flavor is my favorite! Looks delicious! I look no further than the Almond Popcorn Dark Chocolate! Wow, Sounds SO so good. I must get some if I can. Not many places by me that carry this. I resort to mail order a lot these days. One nice thing about “the space and cyber” online age! My favorite flavor is the Salted Caramel at the ball game. My favorite flavor is pecan/salted caramel! SO good, one of my go to snacks! My favorite is Almond Popcorn! So delicious! I like the pecans, popcorn, salted caramel kind. I’d like to try the Pecans/Popcorn/Salted Caramel. The Almond/Blueberry is my favorite flavor! I would love to try the Almond popcorn dipped in dark chocolate. Yum! I like the pecans, popcorn, and salted caramel flavor. I would love to try the Pecan Popcorn dipped in Salted Caramel! Sounds soo good!! The Pecan Dipped in Caramel sounds amazing! Dark chocolate dipped almond popcorn looks divine! I love the Peanut, Popcorn and Peanut butter while watching a movie with my grandsons. The Almond Blueberry Dark Chocolate sounds really yummy! I’m enjoying Fisher Nut Exactly’s Almond Blueberry Dipped In Dark Chocolate Snack Bites while watching a movie. The one I would like to try first is the Almond Popcorn dipped in Dark Chocolate. Peanut butter popcorn peanut!My favorite by far. I do love me some peanuts! I can’t wait to try the pecan popcorn dipped in salted caramel. It sounds positively awesome! I love the dark chocolate almond, and sometimes I pair with a few spoonfuls of peanut butter!!! The Almond Popcorn dipped in milk chocolate looks incredible! Salted Caramel is my only choice! The pecan popcorn dipped in caramel looks amazing. That would be fabulous for our next family game night. My favorite flavor is the almond blueberry dark chocolate. My favorite flavor is pecan caramel. i love the dark chocolate almonds just for snacks! Almond Popcorn Dipped in Dark Chocolate sounds delicious. Dark chocolate is my favorite! I think the Almond Popcorn Dipped in Dark Chocolate sounds so yummy! Pecans/Popcorn/Salted Caramel sounds wonderful love to try it. I like the flavor of peanut ,popcorn and peanut butter. Almond popcorn dipped in dark chocolate covers just about all of my favorites! So definitely my first choice. Almond Popcorn Dark Chocolate looks delicious, especially when Fisher does that giant popout photo on the site. We would take them to the softball field with us. My daughter could eat them in between games to give her a little energy boost. Thank you!! 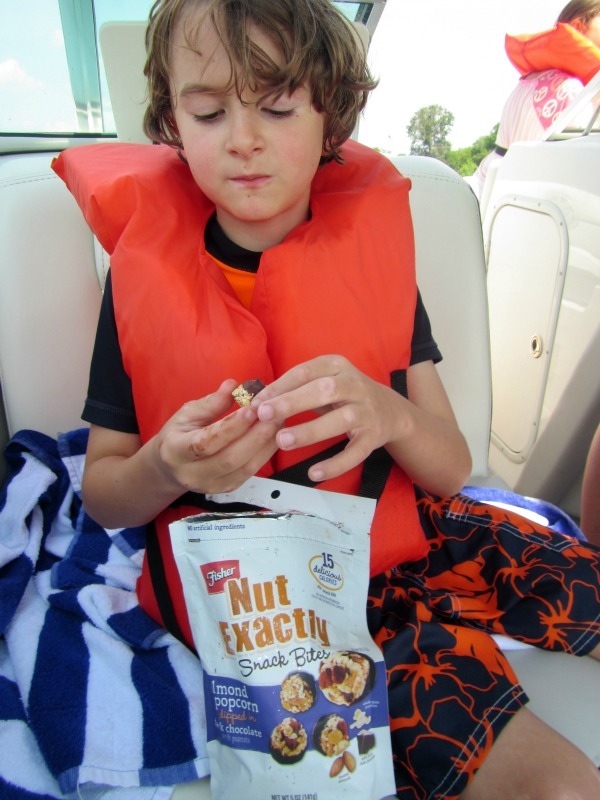 The Almond Popcorn Dark Chocolate will definitely be coming with us when we take the boat out (scallop season begins 6/27!). I always like something salty and sweet when I am swimming in salt water. I am not just a snacker, I am a super snacker and I love the pecan popcorn dipped in caramel over pudding with just a spray of whip cream! I haven’t tried them yet but the Peanut Popcorn one sounds delicious! The almond popcorn dipped in dark chocolate sounds good. I like to just snack on nuts. peanut, popcorn, peanut butter is my favorite. The Peanut Popcorn Dipped in Peanut Butter sounds good. I love the peanut butter popcorn, the minute i open the bag the kids are all over me like a pack of wild wolves, i’m so happy this is a healthy snack alternative vs. the sugary high fat foods. I would like to try the Pecan Popcorn dipped in salted caramel at our drive in theater. I can’t wait to find this product around me and try the Almond dipped in Dark Chocolate! My favorite is the Peanut, Popcorn dipped in Peanut Butter. I haven’t tried them yet but I think I would love the Almond Popcorn Dipped in Dark Chocolate. I think the Pecan Popcorn dipped in salted caramel would be my favorite. The pecan salted caramel popcorn sounds good. Salted Caramel would be awesome! Peanut Popcorn dipped in Peanut Butter is delicious! I would love to try the Pecan Popcorn Dipped in Salted Caramel, it sounds like Turtles candy !! I would love to try the peanut butter flavored one first! I think the Almond/Popcorn/Dark Chocolate sound scrumdillyumptous! My favorite flavor is the Pecan Popcorn Dipped in Salted Caramel. I like the Almond/Blueberry flavor. The Pecan Popcorn with Salted Caramel sounds too good to pass up! We like the peanut popcorn dipped in pb we buy it from Costco every month! My favorite flavor would be the Almond Popcorn Dipped in Dark Chocolate! Love anything with peanuts and peanut butter! My favorite flavor would be the Pecans/Popcorn/Salted Caramel.